If you are concerned about your privacy, and happen to have access to ProtonVPN‘s beta test and are using a pfsense firewall as router, then this might be in your interest. The rough how to is not intended as a step-by-step howto, and I assume you have a little more than basic knowledge of networking, so not all of the steps will be demonstrated with screenshots. It might be applied to other firewalls (which give you similar options) as well, but that is not detailed. Disclaimer: I am not affiliated in any way with ProtonVPN, ProtonMail or pfsense, other than using their services with a paid account. This blog entry is a review of my first impressions after a “hackfull” evening, playing around and learning a lot about pfsense as well (Linux as a secure firewall got shaky lately). Why do you actually need a VPN? Why do you need a VPN in the first place? Who/what are you going against? Do you need to fake the Country you want to appear in, or is your life depending on it? Remember, the path to your browser does not matter if you have a cookie in your Browser that tells them who you are. Having VPN is a nice thing, but it only keeps your ISP out of the loop, ALL the websites tracking you will still keep tracking you, just like they did yesterday without a VPN. Decide which VPN provider you trust! Trust is something that has to be earned, but initially you need a basis on which you can start. A good thing to look up is where the company’s seat is located in, since for example not so long ago a court in the US ruled that Google has to hand over information that is in its posession, but physically not in the country, so take your time to research these things. Are they using up-to-date technology? Forget PPTP, it is just a joke about security. Also a lot of providers’ Settings pages or How to’s are like someone googled about VPN and copy-pasted together something from 2003, where MD5 and PSKs were still valid setups. If you see “our own crypto”, better Ctrl+W that Tab ASAP. Decide what traffic to run through your VPN tunnel. How important is it for you to run ALL traffic through the VPN Tunnel? Is it worth to not run some dedicated traffic through the VPN? VOIP for example is quite sensitive to latency, and forcing it over a VPN jump could distort the voice quality dramatically. How about always-encrypted traffic that is always authenticated and tracked anyway? The VPN Tunnel does (almost certainly) not provide you the same bandwidth as your native speed is. Talking about streaming providers like Netflix or similar: is streaming your movies worth having it streamed over a VPN? Yes is still a valid answer, but keep the question in mind. Another important question is if your internet should go black if the VPN tunnel is down, or do you want to fall back to your default, un-VPN-ed gateway until the connection can be re-established? Ask your wife / your husband as well :-), she/he might have a strong opinion about not having internet during the day. If it’s so important, do not rely on one sole provider but use multiple ones! You need access to the closed beta, which is available for Visionary and Plus customers of ProtonMail, or have to wait until it will be available to the public (? ), which is currently advertised as “Coming in Spring 2017”. For those having access to it, there should be a new icon in Settings, just right below “Keys”, which takes you to a page where you can generate a random username and set a new password for it. They have also a fancy Windows Download-Next-Next-Finish clicky-bunty Native-Client, which can be used directly with your ProtonMail login credentials, and the random username and dedicated password are only required if you plan to use a third-party client, like openvpn. Well, for native OpenVPN clients they actually provide a downloadable zipped collection of .ovpn files, which we will make use of to set up our pfsense. You can find them on their support page for linux at Additional resources. The quality of a VPN Provider can be more or less measured by the technical aspects of how to configure the Tunnel, what crypto it uses and how much bandwidth / latency you need to sacrifice. ProtonVPN uses up-to-date settings, let’s have a quick look at them. The crypto cipher being used is AES-256-CBC with a HMAC of SHA512, so not the old SHA1 with AES-128 that you tend to see. They also include a 2k static key for tls-auth the packages. Embedded there is a CA to authenticate the remote side. which was issued by “C=CH, O=ProtonVPN AG, CN=ProtonVPN Root CA” and is a 4k RSA key with SHA-512 signature, which is currently considered “secure”. ProtonVPN presents a feature that is called “Secure Core“. This consist of Servers located either in Sweden or Iceland, but have a second hop at an endpoint in a different location, and your data travels like You->Sweden->France, so your public IP is in a different country than your VPN Server you connect to. This is quite good for privacy, but relatively bad for latency: it adds about +100ms to +500ms, which has to be considered when choosing a permanent tunnel for a fixed location. The speedtest with the Secure Core was “acceptable”, my 50/10MBit line measured around 39/6MBit throughput and a latency of +120ms totaling around ~125ms. The current setup will show a random Japanese server being used with one dedicated IP net being routed through the VPN (accessing my workplace’s VPN should be routed directly). The pfsense box itself is running on a 3-NIC APU2 Board from PC Engines, which has 4core / 4GB RAM with AES-NI in CPU, so it should handle this burden with ease. At the time of writing the latest version was 2.3.3-RELEASE-p1 [I updated to 2.3.4 during writing the blog entry]. Open the .ovpn config file for your favorite VPN Tunnel and keep it within reach, you’ll need it for a lot of copy+paste work. For the Name, enter something that you know of what this is, using “ProtonVPN RootCA” is probably the best approach for this. On “Method” you can keep the default of “Import an existing CA“. The “Certificate Data” Field is where the content of the <ca> … </ca> section goes, including the lines with the many dashes and BEGIN/END CERTIFICATE. Don't pull routes => If you want to route ALL your traffic over VPN, keep it unckeced, otherwise check. It should look like this at the end. Here you need to check the radio button telling “Manual Outbound NAT rule generation. (AON)“. After that, select on each rule one-by-one the icon of “Add a new mapping based on this one” in the column of Action, and duplicate them with just changing the Interface to OpenVPN. This is required because the remote server pushes routes that will change your routing table to go over their gateway via “redirect-gateway def1“, so you need to allow all traffic to being NAT-ed via OpenVPN. 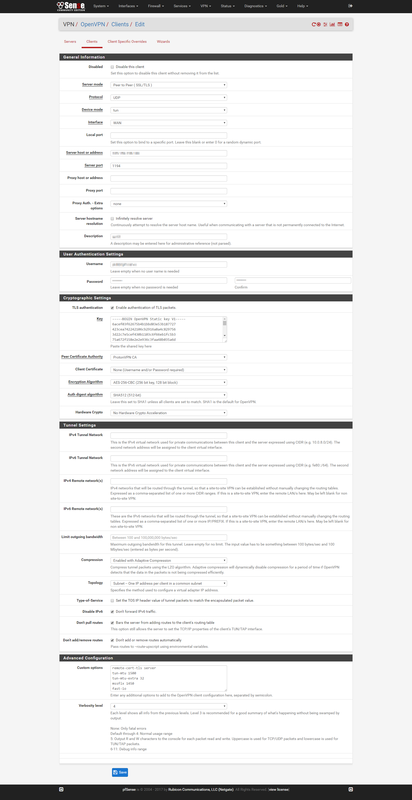 Here we create a new interface for our OpenVPN connection we set up earlier. On the “Available network ports” line pick the ovpncX interface. This will create you an OPTX interface, depending on how many interfaces you already have. Click on its name to open and edit it. 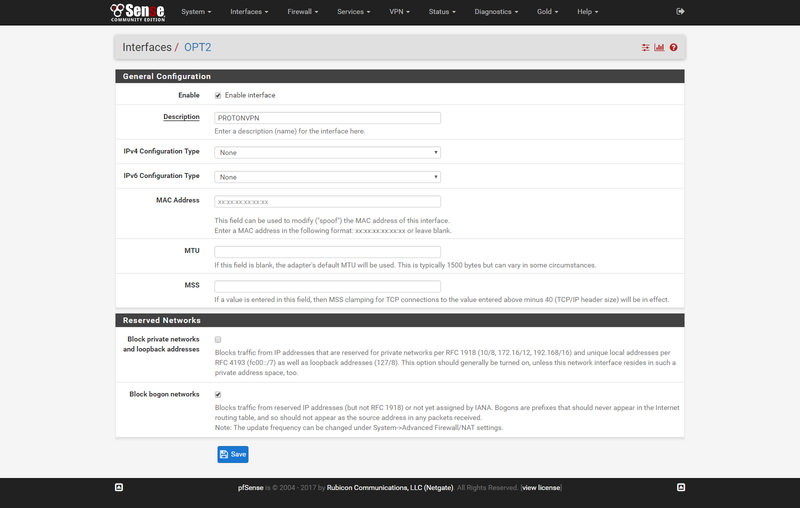 Make sure to choose a Description that will match your setup, since after you got it used by a Gateway, pfsense does not allow you to change it. I have chosen PROTONVPN. Make sure to check “Block bogon networks” but do not check to block private Addresses, since the VPN has a subnet of 10/8, which would be blocked otherwise. Click here to see the whole page. After saving, you should see the new interface being show in the Interfaces drop down menu. You should see the PROTONVPN_VPNV4 and PROTONVPN_VPNV6 gateways created by default. I have chosen to customize them and set up a ping monitoring against Google’s DNS Server 8.8.4.4, and have tuned the ping times higher to compensate with possible reconnects and latency introduces by some of the remote vpn servers. 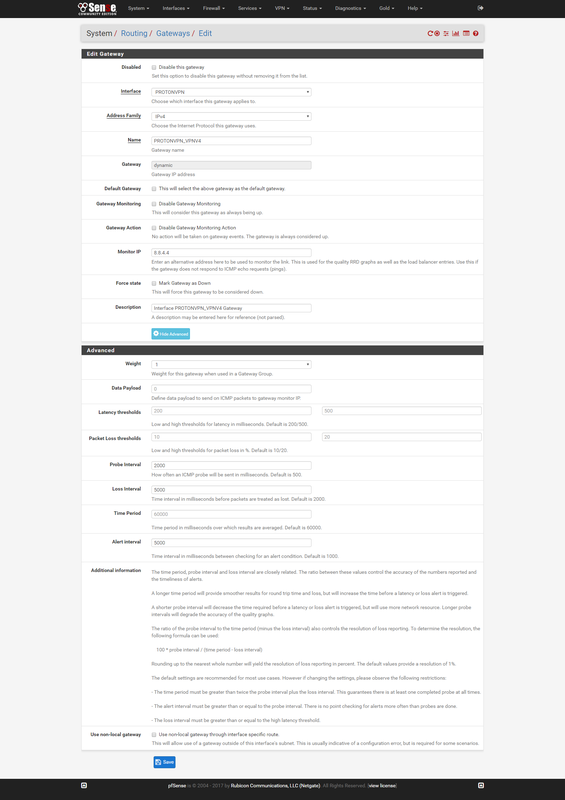 You can see the whole config page here. Depending on if you want to have more VPN tunnels set up to load-balance your traffic, or if you want your Internet not go black if the tunnel is down, you will need to create a Gateway Group. You can skip this part and pay attention at the Firewall rules if you want all your traffic to pass through the tunnel. I have chosen my traffic to fallback to the default Gateway if the VPN is not available, so you have to add the PROTONVPN with Tier 1 and the WAN with Tier 2, and keep the rest unchanged. I personally utilize the Aliases of pfsense, which comes handy to define destinations like WORK_VPN or YOUTUBE or NETFLIX, for which you can find IP subnets after some searching. Later I bundle them together in a DIRECT_ACCESS alias, which holds the separate entries, so I don’t have to touch the NAT Rules after editing this list. Here we need to change “Automatic outbound NAT rule generation” to “Manual Outbound NAT rule generation” to get the freedom to reorder and edit the entries, so they make sense. I have for VOIP Telephony a Fritz!Box, which is in my DMZ, but it is latency-sensitive, and needs a direct port NAT-SIP protocol is not that big of a mess, so that goes on top. I have created three additional NAT rules, that define how the translation will happen if the package arrives from my home network (it’s represented by the USG_DMZ alias). The remaining are the default rules for the outgoing WAN packets, which have been generated by the automatic rule generation. This is the most challenging part, since you need to design your network routes now. We have set up the proper VPN Gateway with monitoring and fallback to the WAN gateway, defined how the packages need to behave if they are sent out via the PROTONVPN interface, now we only need to ensure the packages actually take the right interfaces on their path. 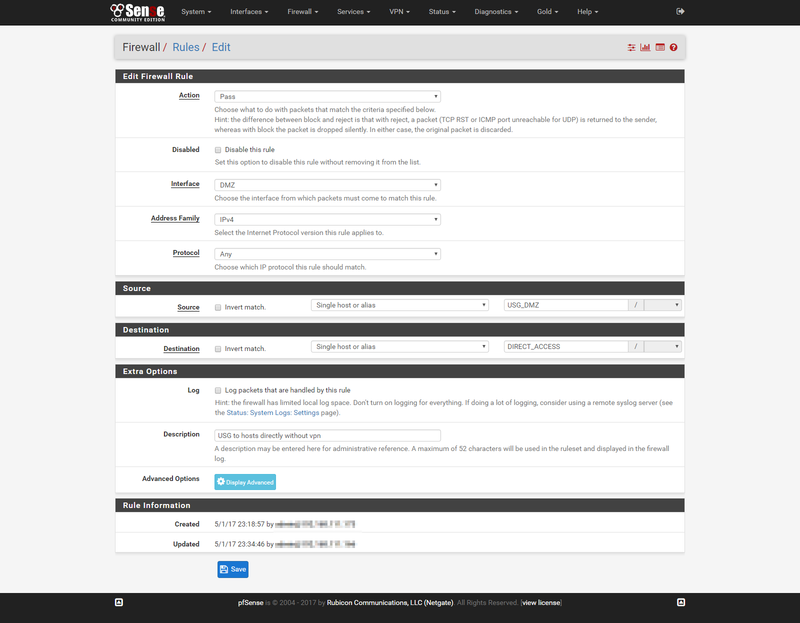 Navigate to the proper interface where your Internet-facing traffic arrives to the pfsense box. For me, this is the DMZ interface, but for you it might be LAN. The next in the list should be a generic rule that catches all remaining traffic to go through the VPN gateway. To achieve this, we will need to open the Advanced options and scroll way down to Gateway, keeping everything else as it is. Here at Gateway you can choose either the PROTONVPN_VPNV4 for VPN-Only, or our Gateway Group called VPN for WAN fallback. 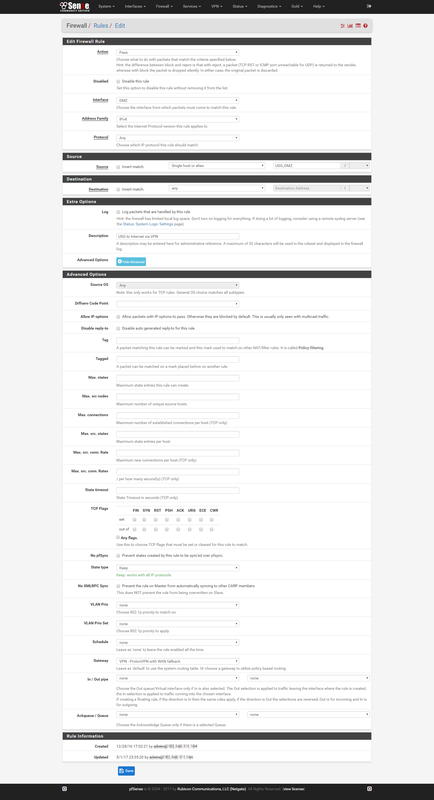 The whole settings page can be viewed here. For all this to work, we need to make sure the ordering is correct, so first we add a specific rule, and below it on that catches all remaining traffic. If you want to choose a different tunnel, just rewrite the IP on the OpenVPN Client settings, it will reconnect and no other changes have to be re-done. I have tried to add multiple VPN Tunnels from ProtonVPN, but apparently they provide you with the same 10.8.8.0/24 IP Subnet, regardless of which VPN tunnel you use, so load balancing between them is currently not possible: having the same IP Subnet with the same Gateway IP of 10.8.8.1 is not something a router can handle. One could add different VPN Providers and round-robin over the different gateways, but as for example Troy Hunt has also pointed out quite good in his long blogpost, putting all your (and family’s) traffic through a VPN does mean they know A LOT of information about you, even if most of it is encrypted. So bottom line is, since there is actually no organization overseeing them, the VPN Provides can be initially measured by the technical implementation of their service, but in the very end, it’s the customer’s trust they have to earn by behaving like they care about security and privacy, how they react to events regarding their customers or themselves, and are not just shipping your IP Traffic from A to B. There is a pretty good way to ensure real privacy of the Content by using PGP, but this is still not a widely adopted or easy-to-use and idiot-proof method of securing the Content of emails. This basically works by publishing your public key (which is not sensitive) to the sender, so it can be used to encrypt the Content of the email, and only you (or others by having your private key) can read it. If you happen to poke around your Facebook security settings, you can find a menu entry about having Facebook sending encrypted emails to you. This is pretty awesome! You only need an email client or service that supports receiving encrypted emails. ProtonMail just happens to use PGP encryption, and has seamlessly integrated it to their core mail service, so every email sent to you encrypted by your public key will transported by End-to-End secured for your eyes only. After clicking Save Changes, Facebook will send you a validation link, that you really receive their Emails. Be aware, that after clicking this link and confirming this shift, all your received emails, including any password recovery mail, will be sent encrypted, so loosing access to the PGP private key could also mean loss of the ability to recover lost passwords. However, this is also why it is actually secure; others cannot intercept emails sent to you, and this can add one small step in securing your Facebook account. We live in times, where data leaks and information theft is daily business well hidden from your life – until it hits you hard. Each small step counts. Conferences can be entertaining, informative and sometimes mega fun. I have attended quite a few in the past, but most of the time I lacked one important thing to really enjoy them: having a deep understanding of the topic (Ok, most of the time this was not the issue) and being a part of the community and know people. This year I have the great opportunity to attend the Config Management Camp in Gent, and meet with a lot of known and new people interested in the topic. The mostly excited thing is always to hear the stories and about the problems that you don’t find in Google, either because one lacks the time to write about them, or one has a strict corporate policy about social media usage and publishing internal topics. There are of course evening events where stories are being told, that happened with a friend of a friend, but the essence stays the same. This post is telling about things you should pay attention to if you are an Android user. You will probably use your phone more than anything else to connect to the world: online banking (even if just receiving SMS TAN codes to authorize payments), chatting about your love life with your partner(s), taking personal and sometimes highly private pictures, and putting that all on some kind of Social Media – we do all that daily, almost contantly. Your smartphones run on a SoC (one chip that contains cpu, graphics, memory, phone modem, GPS etc), and they have proprietary driver, dedicated to an Android version’s kernel. No newer driver means no updates to a fresh Android version. You can have bad luck and getting something with Android Kitkat 4.4.x, which still had 75%+ market share as of mid of last year, and is like a Swiss cheese. I see a lot of people just using swipe unlock. Your phone can be stolen or lost. Happens some. Just think about it, when I would borrow you’re phone, would you like me to check out all your emails, browsing history, personal contacts, SMS, Facebook? Probably not. Use a secure unlock code or pattern. I use the subway a lot. Most people use their phones to kill time. I have whitenessed countless L or I shaped unlock codes. Yeah… Or 1234, 2570 etc. It works as long I don’t see you use it once. I might be your colleague during you grabbing a coffee. Sometimes you can also make the 3×3 pattern matrix to a 4×4 or 5×5. Helps to confuse the remote eye a bit, and you can still get used to it. Newer Android versions come with default FDE (full disk encryption), but use a default well-known password if you don’t use a numeric pin or password or pattern to unlock the device. Even having the latest version of Android means you are everything month more and more vulnerable to the almost weekly found issues in the Android OS. Depending what device you own, you can have either a caring provider, who keeps up with the recent monthly security patches from Google, or at least quarterly/yearly is highly recommended. For those concerned about Internet security, I will write a next post on how to secure communication between actors and their devices.